Have you considered professional graphic design for your wedding invitations? As a family owned and operated business, we at Bellia Print & Design thoroughly enjoy helping our clients prepare for and celebrate momentous occasions. Our talented in-house graphic designers and customer service team will work with you throughout the entire process to ensure your wedding stationery is everything that you imagined it to would be. When working with Bellia Print and Design on your wedding stationery, you have a few options to choose from. You can select a design from one of our beautiful templates or you can have our graphic designer custom make the wedding stationery to match your theme perfectly. Our graphic artists specialize in the latest digital design platforms and are dedicated to creating designs that are sure to impress your guests and set the tone for your special day. We will help you illustrate and share your love for one another with beautiful printed details. We offer a complete professional graphic design for wedding invitations including announcements, invitations, RSVP cards, custom envelopes, and more. Our team of experts will design, print, and assemble all of your wedding stationery. For more information on our graphic design services and Events by Bellia, contact us today! 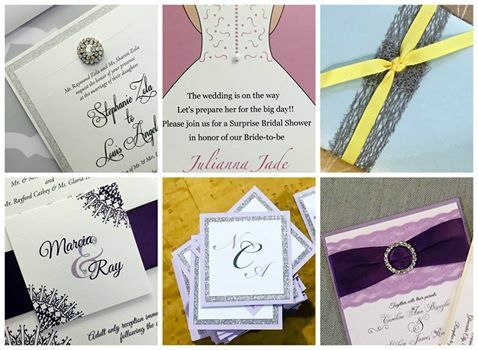 Are you looking for a print and design service for custom wedding invitations in South Jersey? Get in touch with Bellia Printing today! 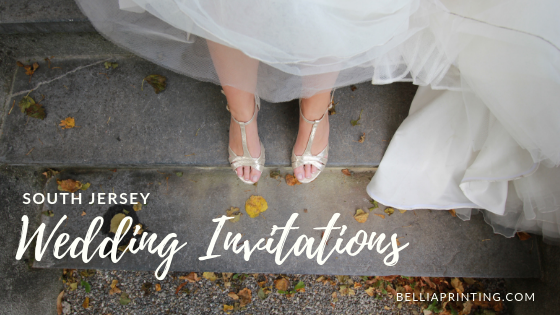 Our offices are based in Woodbury and Glassboro, and we offer first class, professionally designed wedding invitations and announcements for clients throughout South Jersey. Our professional team of talented artists will meet with you and work to create an invitation that is completely unique and makes a lasting impression. We’ll discuss all of the details, show you sample artwork to help you select the style that works, and explain design elements throughout your consultation. We add textures, photographs and accents, and we print your invitation on high quality, durable stock that your invited guests will want to save. Your guests will be captivated the moment they see their invite. 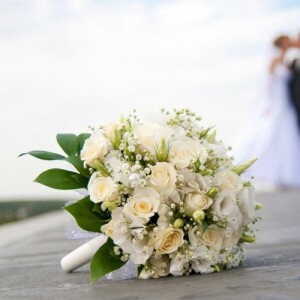 Bellia Printing can provide you with a complete wedding package for this most important day, with invitations, announcements, RSVP cards, customized envelopes and much more. Our Weddings By Bellia team of experts will design, print and assemble all of the stationery and handle any essential tasks. 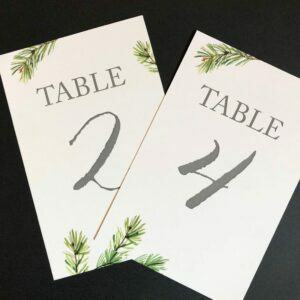 Need additional items like table number cards, seating charts, thank you notes or any additional printed work? Leave that to us too…we can provide all of these things and much more. With Weddings By Bellia, you get all of the advantages that our small, family-owned print company has to offer. We place no minimum on orders, have a fast turnaround time, and we offer competitive and fair pricing. We invite you to find out more about why our clients have voted us the best in Gloucester County for seven straight years! Whatever your print needs, you’ll get nothing but beautifully designed and professional work from the team at Bellia. 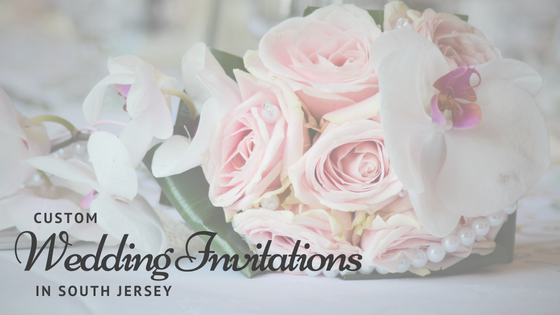 When you need quality custom wedding invitations in South Jersey, click here to request a quote or call us today to speak with one of our representatives. We look forward to helping your special day shine! We love a personalized wedding, and beautiful signage will not only help you put your own creative spin on your day and keep your wedding guests informed, but it will also add to the décor. Welcome: They’ve traveled from near and far. A pretty sign with the names of the bride and groom and wedding date let’s your guests know they are in the right place. Seating: Do you have a preference as to which side your guests sit on? Let them know either way. Program: No program books. No problem. Have a sign made with the wedding party and ceremony info so your guests are in the know. Menu: Having a buffet? Tell your guests what they will be filling up on with a beautiful enlarged menu. Bar: Will you be offering a signature drink? Let your guests know what it’s called and the story behind it by placing a pretty sign on the bar. 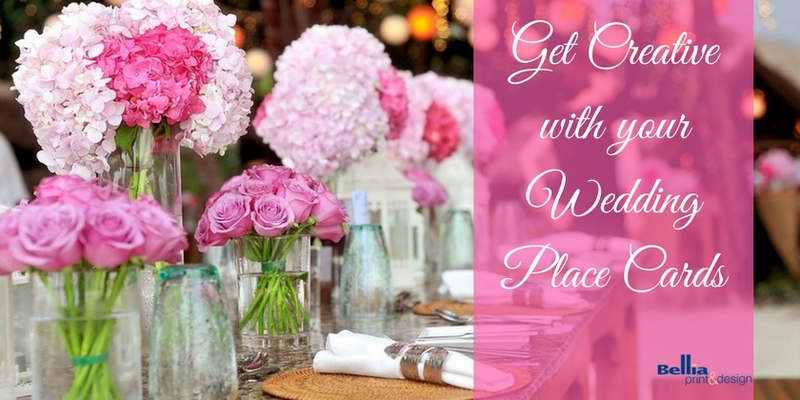 Seating Chart: Prefer a seating chart instead of place cards? A pretty one will add to the décor. Instagram: Are your guests on Instagram? 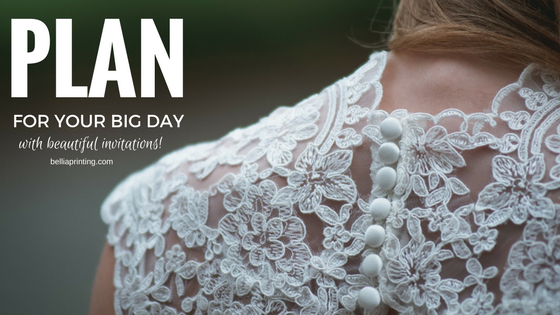 You’ll want them to hashtag your big day when they post. Signs with the hashtag info are always a great idea, especially if you have a photo booth. At Bellia Print + Design, we have a dedicated design team that can create beautiful signage to match the theme of your wedding. With many different paper options we offer invitations, announcements, rsvp cards, menus, custom envelopes and more for your special day. Visit us here. Thinking about Choosing a Wedding Theme? If you are overwhelmed by all of the decisions you have to make, having a theme will help to narrow down your choices such as cake, flowers, décor, and stationery, to name a few. Have your wedding reflect your style. Are you more bohemian, traditional, modern, etc? Do you already have a dress? Is it trendy or classic? Does it have lace, a pattern, or some sparkle to it? These details can be incorporated into other areas of your wedding. Do you and your fiancé have mutual interests or hobbies? Do you both like to travel, read, have a favorite movie, or are you big sports fans? Pick a favorite, and the ideas will just start to flow. Base your theme on the season. If you are interested in colors for a theme, the season your wedding is taking place is a great inspiration. Location. You can base the theme according to where your wedding is taking place. For example, if you are having a destination wedding on an island, you’ll probably want a tropical theme, and if it’s taking place somewhere more rural, you can go with rustic. At Bellia Print + Design, we have a dedicated design team that can create the perfect stationery to match your theme. With many different paper options, we can create beautiful and unique pieces, including invitations, announcements, rsvp cards, menus, custom envelopes and more for your special day. Visit here to learn more. 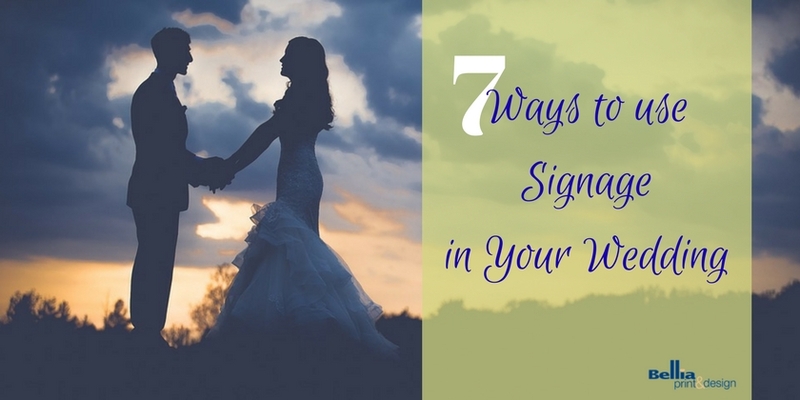 While wedding programs are completely optional, they are a nice way of keeping your guests in the know, telling them what to expect, and allowing them to follow along during the ceremony. Plus they make excellent reading material as your guests wait for the ceremony to begin. 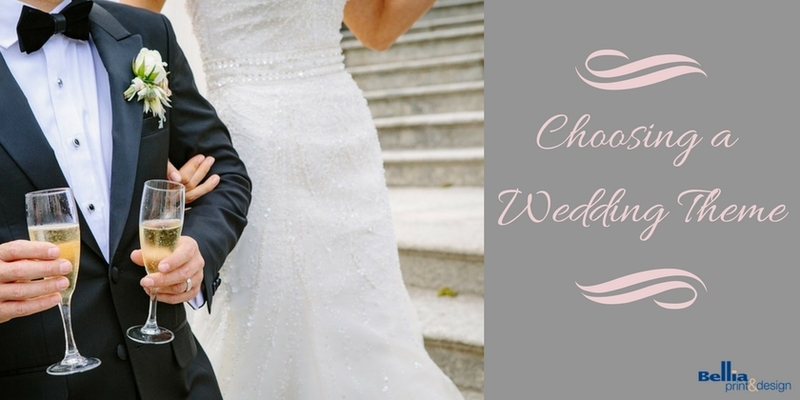 Your wedding program can be as formal or informal as you like, depending on the type of wedding you are having. The order of information should follow the timeline of the ceremony, and all programs should at least include the name of the couple, wedding date and location. 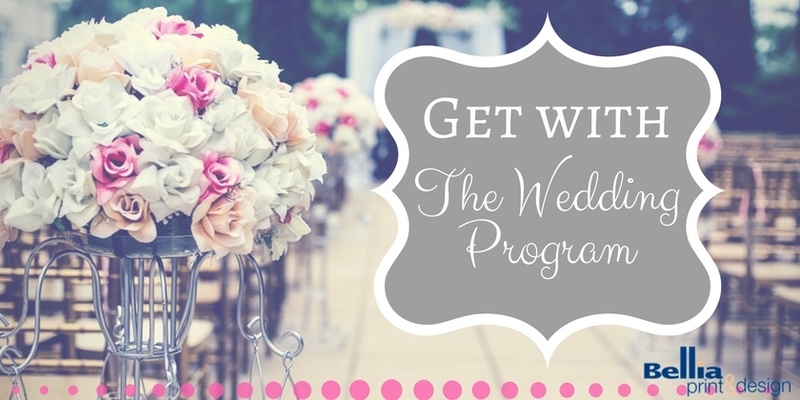 Keep your program simple on a single card by just including an itinerary, names of those in the wedding party, and titles of readings and musical pieces/songs. Or fill the pages with your love story, a message to guests thanking them for being with you on your special day, and honoring those who are not. You can also add pictures, explain religious and/or cultural traditions, and share the relationships between you and your bridesmaids and groomsmen. Have fun with your program and be as creative as you’d like! Bellia Print + Design has many different paper options, and an excellent graphic design team that will help you tailor your program to your wedding. Getting Married in South Jersey? Have you considered professional graphic design for wedding invitations. As a family owned and operated business we at Bellia Print & Design thoroughly enjoy helping our clients prepare for and celebrate momentous occasions. Our talented in-house graphic designers and customer service team will work with you throughout the entire process to ensure your wedding stationery suite is everything you imagined it to be. We have a number of templates to choose from, but if none of them fit your vision exactly, our graphic designers will work with you to create a design that fits you and your theme perfectly. Our artists specialize in the latest digital design platforms and are dedicated to creating designs that are sure to impress your guests and set the tone for your special day. We will help you illustrate and share your love for one another with the creative printed details. If you are not completely sure what type of stationery best suits your event or theme, our designers will happy to discuss your ideas with you to get a better understanding of what you are looking for. With our talented artists, anything is possible. Please visit us at any of the above shows to see our new work, including Save the Dates, invitations, seating charts, and more!